When The Travel Bug was on his Tuscan tour with his humans, he popped over to the beautiful city of Siena to have a look around and see what fascinating facts it had to offer. The very first bank on the planet, the Monte dei Paschi di Siena, was founded in 1472 in the city. TTB doesn't really like banks that much. He prefers to keep his Euros in his shell. Siena is home to the second tallest tower in the whole of Italy, and one of it's most visited tourist attractions, the Torre del Mangia. TTB climbed all the way to the top and can confirm that it is, indeed, very high. Way too high for a little bug. Siena is a haven for popular sports, including football and basketball, but is also famous for being the start and end location for the Strade Bianchi, a professional cycling race, covering more than 50k. The race finishes at Piazza del Campo in the old city. TTB can't use a bike as his little legs are too short. 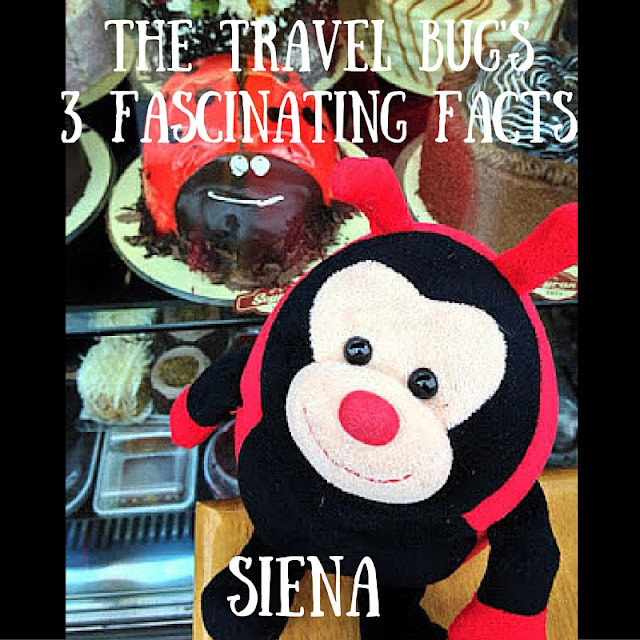 Do you have any more fascinating facts about Siena to share with The Travel Bug?